Every glass pane is handmade. Each piece of lamp was specially created by glass, which gives the lamp extra beauty because the light is reflecting through several colors. Beautiful, romantic and energetic stained glass lamp.It's suitable for your bedside, bedroom, office or living area. Unique and stunning handcrafted design. It will create a unique atmosphere in any room. Applicable scenes: living room, bedroom, restaurant, study, etc. 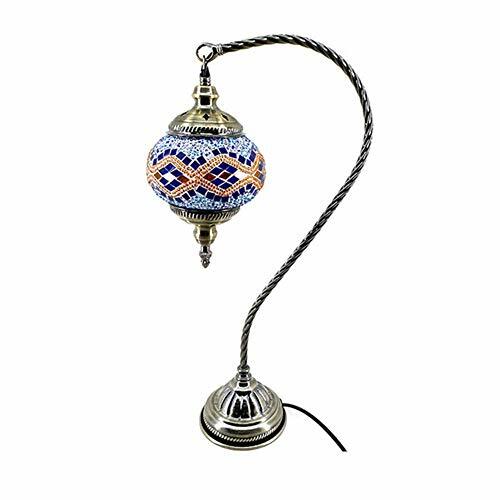 Lighting is like Jewellery for your home or your workspace. Table Lamp completes your indoor design and shows your imagination. It will add amazing and soft light your bedroom, office, living space, foyer. Original handmade ecological lamp,Decorate for home, office, rooms, cafe, bedroom, hotel, restaurant, library. If you have any questions about this product by OOFAY LIGHT, contact us by completing and submitting the form below. If you are looking for a specif part number, please include it with your message.